Tottenham striker who has been on bench for a while now, Emmanuel Adebayor recently displayed affluence as he flaunts his mansion home, cars, and private jet on Instagram. If you recall that the Nigerian-Togolese football star, few hours after returning from Nigeria where he came to honour Peter Okoye of P Square for his traditional marriage to Lola Omotayo, the wealthy striker, Seyi Emmanuel Adebayor popularly called SEA has revealed his assets. For those who don't know, Adebayo is equally a smoker, check out this photo of him smoking Shisha pipe. 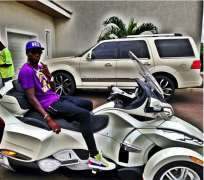 Adebayo took to his Instagram page yesterday to flaunt his most expensive assets. The footballer is indeed a big boy. On his photo sharing page, he shared different pictures of his private jet, his expensive custom built wonder on wheels, mansions, power bikes and some scene from his summer trip to Miami Florida. [PICTURES] CHRIS ATTOH AND YVONNE NELSON… IN SECRET WEDDING?